How experienced are you in the medical device industry? J-Pac Medical has been in business since the late 1970s. We focus exclusively on medical and diagnostics. We operate in a 60,000 s.f. freestanding manufacturing building, which houses 11 cleanrooms. We ship globally. We have an Innovation Services group that is dedicated to helping customers through all phases of the process, from determining requirements through transfer to manufacturing. You will be assigned an engineer to assist you. Once your program is in production, you will be serviced by our customer service team. Yes. We work with both large and small companies, including start-up companies that are funded. Should the packaging performance qualification (distribution simulation) be done at the same time as the stability study? No. ISO 11607-1 Section 6.4.4 indicates that stability testing and performance testing are separate entities. Stability testing is testing the sterile barrier system. The stability test will demonstrate the shelf life of the sterile barrier irrespective of what is inside the package. Performance testing is testing how the packaging system responds to shipping and handling stresses. The performance test must demonstrate that expected shipping stresses do not compromise the sterile barrier. How do you validate packaging? 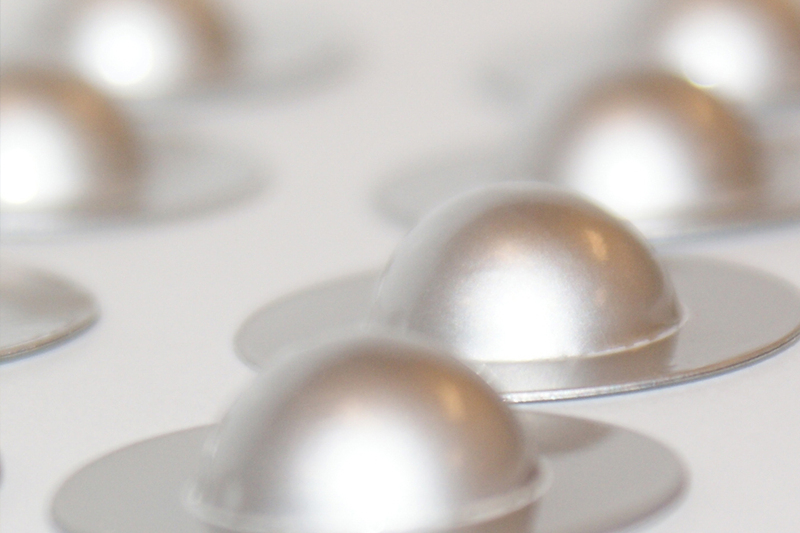 The manufacturing process to produce the packaging’s sterile barrier system must be validated. This requires an Installation Qualification (IQ), Operational Qualification (OQ), and Performance Qualification (PQ) to be conducted on the manufacturing equipment. Packaging performance testing must be completed. This includes manufacturing and sterilizing under worst-case conditions and subjecting the packaging system to simulated distribution testing. A stability study must be completed and is typically done with both accelerated and real-time aging studies. Both the performance testing and stability study require tests for seal integrity and seal strength as well as an evaluation of product protection. What testing has to be done under worst-case conditions? The Performance Test includes the simulated distribution test and is a separate test from the sterile barrier stability study. In practice, the most typical “worst-case” manufacturing conditions are related to variables affecting seal strength. However, there is no formal definition provided by the standard. It is up to the manufacturer to define “worst-case” manufacturing conductions. Are microbial challenges required for validation? There is no universally accepted method of demonstrating microbial barrier properties, although there are efforts to address this that may eventually be incorporated into the standard. The part 1 standard section 5.2.2 indicates only that the microbial barrier requirement can be demonstrated by showing the material is impermeable. Annex C requires that impermeable materials for sterile barrier systems shall be tested for air permeance in accordance with ISO 5636-5. Other tests are noted in Annex B. In practice, demonstrating a sufficient microbial barrier is performed on the material itself by the raw material supplier and their test reports can be referenced in the MDM’s technical file. Do I need to include an IFU (Instructions For Use) when testing? The IFU is required for the package performance test because it may impact the integrity or strength of the sterile barrier during shipping and handling. For example, an IFU with sharp edges may cause tears. How do I determine sample size? There is no single standard for sample size selection. When determining the right sample size for your product, the most important factor to consider is risk. ISO 11607-1 section 4.3 indicates that sample sizes must be based on some statistical rationale and references sampling plans in ISO 2859-1 and ISO 186. Is cleaning validation required for orthopedic implants? If the orthopedic implant is cleaned prior to packaging, the cleaning process must be validated to ensure a high probability that the cleaning specifications are met (FDA CGMP). There have been numerous recalls in orthopedics caused by cleaning processed getting out of control, which left patient harming contaminants on the product. A cleaning validation should be evaluated starting with a product and process FMEA that shows possible sources of contamination and their impact and severity. What tests are used for a cleaning validation? Cytotoxicity: a test for overall safety, measuring if the device material or residuals are cytotoxic. Bacterial Endotoxin: a test of harmful endotoxin contamination, which is typically introduced by water and can be very dangerous to patients. Bioburden: a test of fungal or bacterial contamination. ISO 11607 is the standard for packaging terminally sterilized medical devices and is comprised of two parts. ISO 11607-1:2006 specifies the requirements and test methods for materials, preformed sterile barrier systems, sterile barrier systems, and packaging systems that are intended to maintain sterility of terminally sterilized medical devices until the point of use. ISO 11607-2:2006 specifies requirements for development and validation of processes for packaging medical devices that are terminally sterilized. These processes include forming, sealing, and assembly of preformed sterile barrier systems and packaging systems. Part 1 addresses Materials and Design while Part 2 addresses Packaging Process Validation. These are both required to satisfy the Essential Requirements of the European Directives to achieve CE Marking. Additionally, this guidance document is recognized by the FDA and used for premarket review submissions. What package design services does J-Pac offer? J-Pac offers a turnkey ISO/FDA compliant package design process that can be integrated into your technical files. We start with documenting customer requirements for packaging, which includes usability issues and aseptic transfer requirements, as well as labeling preferences. Next, we document the packaging system requirements that consider storage and transportation conditions, cleanliness, bioburden, and expected environmental stresses and constraints. Sterility methods and material compatibility are also assessed at this time. Based on these inputs, we design both the sterile barrier system that will prevent microbial contamination as well as the protective packaging that will protect both the product and the sterile barrier system during shipment. Next, we manufacture prototypes under worse-case manufacturing conditions and test the feasibility of these designs in our in-house lab to ensure a high probability they will pass simulated distribution testing. Once the customer approves the prototypes, we can test usability with our panel of surgical nurses to ensure we meet the requirements for usability. All of this design work will be conducted under an ISO 13485 quality system including requirements specifications, test protocols, validation plans, and test reports and these are provided to the customer for their technical files. We also manage all outside testing services. Do orthopedic implants need to be double packaged? There is no regulatory requirement for double packaging orthopedic implants but there are several factors and requirements of ISO 11607-1 that influence the decision. Section 6.2.2 requires that the package allow the product to be presented in an aseptic manner. While this does not require a double package design, some surgeons prefer to have a “belt and suspenders” approach where the inner package prevents any unnecessary contact while sitting in the sterile field. Additionally, many circulation nurses prefer the ability to transfer the device to the sterile field without waiting for someone in the field to take it out of the package. A double package design can facilitate this - often called “dumping,” “throwing,” or “dropping,” by OR nurses. Additionally, the standard section 6.1.1 requires that the package protect the safety of the user and patient. Some implants have sharp features that may make a double package design desired. Lastly, the issue may come down to surgeon preference. What is the determining factor in determining shelf life? The FDA defines shelf life as, “the term or period during which a device remains suitable for its intended use.” Fitness for use can be impacted by both maintaining sterility of the package and ensuring the device performs as specified after aging. A risk-based approach should be used to determine the potential impact of using a device that may no longer be fit for use. Some devices will experience degradation over time and the risk of that degradation to the device’s fitness for use must be assessed when determining specifications and tolerances for manufacturing and components. A stability study must be conducted on the sterile barrier system. Samples (without product) typically undergo both accelerated and real-time testing to establish the shelf life of the seal. Accelerated testing is allowed for market launch but must be followed up by real-time data. Accelerated aging should follow ASTM F1980, which details the Arrhenius equation that is commonly used. This equation is based on the principle that every 10°C increase in temperature doubles the reaction rate. Both accelerated and real-time aging should be done on packages that have undergone worst-case sterilization. Product testing can take many avenues including material strength testing as well as visual inspection and functional testing. The product stability tests should be conducted on a packaged product that underwent worst-case sterilization and simulated distribution. Can the product shelf life testing be done at the same time as the stability study for the sterile barrier? The product shelf life testing and the stability study should be done separately. The FDA defines shelf life as the term or period during which a device remains suitable for its intended use. Fitness for use can be impacted by both maintaining sterility of the package and the post-aging performance characteristics of the device. These are two separate items and should be tested separately. The temperatures that are appropriate for SBS materials may not be applicable to device materials. This may jeopardize the otherwise successful stability study on the SBS. When devices are included with the SBS during stability studies, they often interfere with many of the tests that are conducted on the SBS at each aging interval. Devices often have a functional shelf life, which is much less than that of the SBS. These device limitations would unnecessarily shorten the dating claims for future products using the same SBS materials. MDMs that include devices in their SBS stability studies often end up linking that particular device with the specific SBS used. They then feel it is necessary to repeat the stability study on the same SBS materials if a different device is packaged in it. This is not true. It is much better to keep SBS stability studies independent from any specific device. How does J-Pac perform a cleaning validation? J-Pac uses approved protocols for all validations, including cleaning. The validation is designed to show that contaminants that come in contact with the product during manufacturing and packaging are safely removed. These contaminants include organic residues (such as oil), inorganic residues (such as leftover particulates from processing), and microbiological contaminants (such as bioburden from inadequate operator hygiene controls). What design services do you offer for reagent blisters? J-Pac offers a full range of design services to provide you with a turnkey solution. 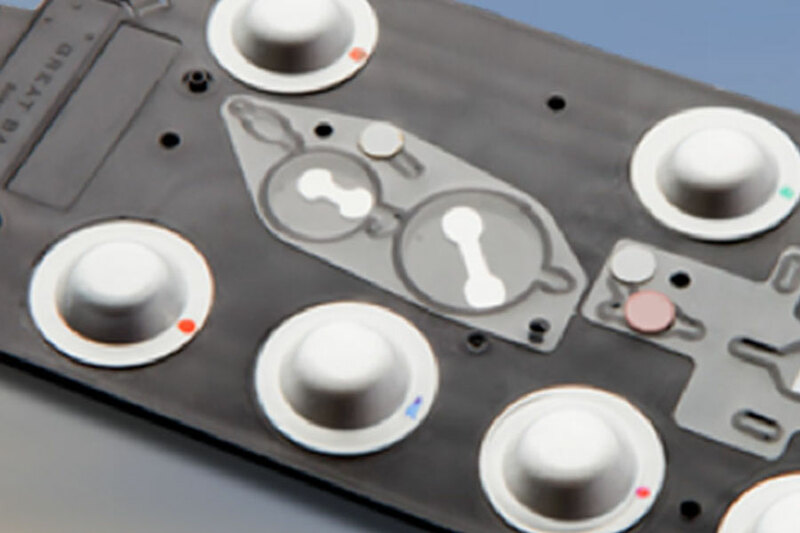 We work closely with you to understand the technical requirements for burst strength, activation, and other critical parameters and design a blister and manufacturing process based on those inputs. We are an FDA Registered, ISO 13485:2016 certified company with extensive expertise in blister design, material selection, and manufacturing. Other services include rapid prototyping, 3D modeling, Design of Experiments, Accelerated Shelf Life Testing, and Validation. We select materials based on the specific needs and reagent chemistry. For most applications, a multi-layered foil material is used that consists of a lidding foil and forming foil. What is the force required to actuate a blister? The force required is greatly dependent on the actuation mechanism (e.g. lance, manual compression, etc). A general guideline is 30N +/- 15N. How do you actuate a blister? We have experience in many actuation methods. Common approaches include lancing, mechanical compression, and rolling. What amount of fluid is recovered from the blister? The amount of fluid recovered varies by the actuation and recovery method. A rule of thumb is 90% for common methods. What volumes can be filled? Filling is custom to the application. A general range is between 30-1,000 μL. Can you perform low oxygen filling? We have proprietary filling technology that can achieve both 100% fill as well as extremely low O2 levels. What is a common fill ratio? A fill ratio of 80% full is common, resulting in a headspace ratio of 20%. How do you mount the blisters? Blisters are typically mounted using a pressure sensitive tape that is custom fit to the microfluidic cartridge. J-Pac has three ranges of production capacity. Our lab can supply small volumes of less than 5,000 units. Our semi-automated production lines can produce up to 5 million units per year. Our automated lines can produce more than 30 million units per year. What in-process quality control (IPQC) do you have? Reagent Quality: Certificate of Compliance, pH, Conductivity, Specific Gravity, and other customer directed tests. Fill Volume: Validated production processes, 100% weight check in certain applications, SPC controls. Functional Testing: We recreate the customer’s activation method and test burst strength. Can we get blister samples? Yes. J-Pac has developed off-the-shelf samples that are an affordable and timely solution for up-front development. J-Pac offers several types of samples for purchase. Does J-Pac Medical have cleanroom capabilities? We utilize eleven class 7 and class 8 cleanrooms by customer to maintain confidentiality and control. We also have a dry cleanroom where we can control temperature and humidity for sensitive products. Active cleanrooms are monitored monthly for non-viable particulates and quarterly for viable particulates. The cleanrooms are certified annually and our laminar flow hoods are certified semi-annually. Employees and service providers to these rooms follow internal procedures on gowning and how to properly transfer materials to and from the cleanroom. Airborne particle counts ISO 14644-1. We actively trend all of our data and maintain alert and action levels specified in ISO 14644-1. Does J-Pac have the ability to purchase prescription components? J-Pac Medical maintains a Board of Pharmacy Certificate, which allows us to purchase prescription drug and devices to be incorporated into customer devices. How fast can changes be made in your system? For urgent situations, changes can be implemented the same day as the request, as long as it does not impact the supply chain. Can J-Pac sterilize our product? J-Pac does not sterilize product onsite but we do have several sterilization houses on our approved supplier list and will work with you to determine which one best suits your needs. Are you able to perform additional testing required for product releases such as endotoxin or bioburden? While J-Pac Medical does not perform the actual testing of the samples we do have a laboratory that is on our approved supplier list that performs any required test. Yes. Our FDA registration number is 1221051. Yes. We are certified through BSI to ISO 13485:2016. Our certification number FM 66316. How do you control labels? We manage all label functions in one secure area. We handle labels both provided by customers and printed on-site. We have a label accountability process that accounts for every label in stock. What type of material can you form on your tray thermoforming process? Our commonly used materials include PVC, PET/PETG, styrene, High Impact Polystyrene (HIPS), polycarbonate (Lexan), polypropylene, as well as other unique and specialized materials. Our engineering team and plastics partners are able to assist in the development of packaging utilizing unique properties and characteristics specific to your application. Our thermoforming processes are capable of both thin-film and thick-film applications, in continuous roll feed as well as single sheet format. How do you manage your supply chain? J-Pac Medical utilizes a network of top-tier suppliers to the medical device industry, ensuring the highest quality components for a variety of applications. Our suppliers are thoroughly vetted and qualified to stringent Approved Supplier List standards, compliant to FDA and ISO 13485 standards for supplier qualification. Our Total Package approach to supply chain management ensures efficiency in pricing, quality, and service to our customers. How efficient are your operations? J-Pac Medical utilizes a system of Lean Manufacturing to manufacture and package our medical devices and components. This approach to manufacturing, eliminating waste, and driving the responsibility and ownership of quality and reliability down to the Operator level, ensures that all products are produced correctly to specification, the first time, every time. Our Lean Manufacturing culture also focuses on the elimination of complexity, ensuring that processes are intuitive and documented for consistency and reliability. Our teams are measured against Key Performance Indicator metrics, ensuring performance alignment to customer expectations and specifications and ensuring that issues are addressed real-time, at the point of operation. What is a medical grade textile? 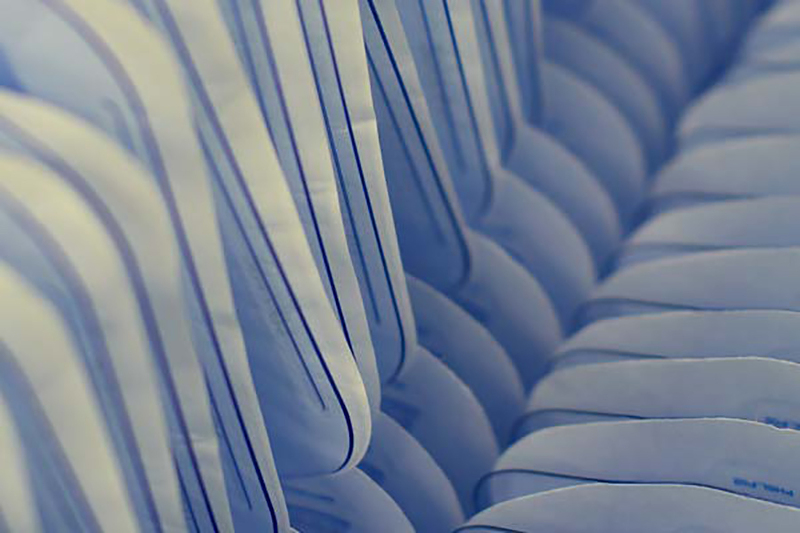 Medical grade textiles have minimally been tested for hemolysis, cytotoxicity, and intracutaneous reactivity. The materials are lot controlled and have full raw material traceability. A Certificate of Compliance is provided with each shipment of product to our customers. Does J-Pac Medical make the textiles that it converts into products and implants? No. J-Pac Medical works with all textile providers that can provide medical grade textile materials. J-Pac provides cutting, shaping, assembly, packaging, and sterilization of these materials to provide a turnkey service for its customers. What polymers are most common in the textile constructions that J-Pac Medical works with? The most common polymers are Polypropylene (PP) and Polyester (PET), although Polyethylene (PE) and Polytetrafluoroethylene (PTFE), and absorbable polymers are also processed. These can be in the form of textiles but are also in the form of injection molded components. Absorbable Polymers include lactide/glycolide combinations and Polydioxanone (PDO), as well as others. What formats of textiles are converted at J-Pac Medical? J-Pac Medical primarily works with Braids, Weaves, Knits, and Non-woven Structures. The braid materials are typically multifilament strands that are used broadly in sutures and sports medicine applications. Woven materials are fabrics that are dense (low pore size) and are dimensionally stable in all directions. These are typically used in wound care and critical filtration applications. The knitted materials are more open structures (larger pore size) that typically display a stretchy direction and a stable direction. These are used in soft tissue repair applications as well as filtration applications. The Non-woven materials are dense and strong. These materials are used broadly as tissue protecting sewing rings or pledgets in a broad range of cardiovascular applications. Steel rule die cutting of medical grade textiles can provide unwanted fracturing or particulate generation. J-Pac Medical offers cutting methods that are housed in Class 7 cleanrooms and provide cut parts that are free of cutting-generated particulate. This is very important considering many of the components that we cut are destined to be surgically implanted or are utilized in critical filtering processes. Does J-Pac Medical have textile implants available for sale? No, J-Pac Medical has no products of its own. Textile implants are built to our customer’s specifications and the design history file (DHF) resides with our customer. When woven or knitted textiles are cut, the integral construction of the fabric is broken and the construction can begin to unravel. Edge treatment processes offered by J-Pac Medical recreate an unbroken edge at the point of cutting that will maintain the original fabric construction and stop any fraying. The created edge also improves handling in surgery and improves tissue passage. When braided strands are cut with typical processes, the multi-filament construction will unravel from the point of cutting. Tipping methods provided by J-Pac Medical maintain the braid construction at the point of cutting.